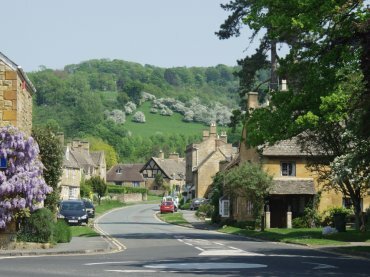 Broadway, although being in the Cotswolds, is actually in Worcestershire and not Gloucestershire. 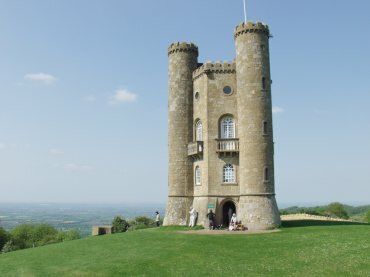 It is about 4 miles slightly south of west from Chipping Campden and is at the foot of the Cotswolds Scarp. The Cotswolds Way which starts at Chipping Campden then runs down the scarp slope and through Broadway before going back up the slope near Snowshill. This view is looking along High Street at the Cotswolds Scarp slope. Travel a little west on High Street from the above point and a meadow comes into view on the south side. 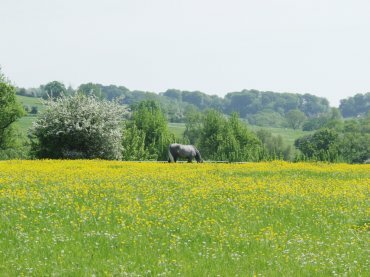 It was, as you can see, covered in Buttercups when we were there in May. This tower is on the top of the scarp slope, at 1024 feet, about a mile and a half south east of Broadway. It dates from 1799 and is an example of a Gothic folly. It is open to the public, although you should check opening times before you go, and there is a charge to go into the tower. It's free to walk around the outside and there is a free car park with a cafe next to it. St. Michael and All Angels Church, Broadway. 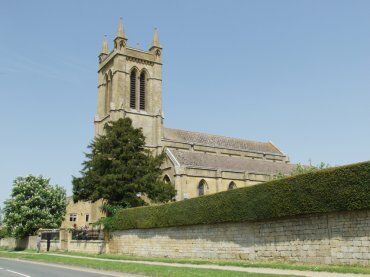 This church looks very impressive but it is relatively modern having been built in 1840 to replace the much older church about a mile down the road. The older church was considered, in Victorian times, to be a bit far for the parishoners to go but it still exists and is in good order.